I went in to town and bought an air-impact. This compact 1/2" one was rated at 500 ft-lbs and cost a modest $90 so I picked it up. Alarmingly, the set of impact sockets were $50 and I only needed the 22mm, but it wasn't sold individually... whatever I bought them, gotta get the job done after all. I figured with the upcoming motor swap in the T100 I would get some good use out of them. The impact is actually quite nice and very light/compact for the power. I'll be bringing this back to Canada to augment my selection there. I hooked it up to my tiny little pancake compressor and while it only gave me about 5 seconds of full power action before it needed to pump itself back up again, it got the job done. 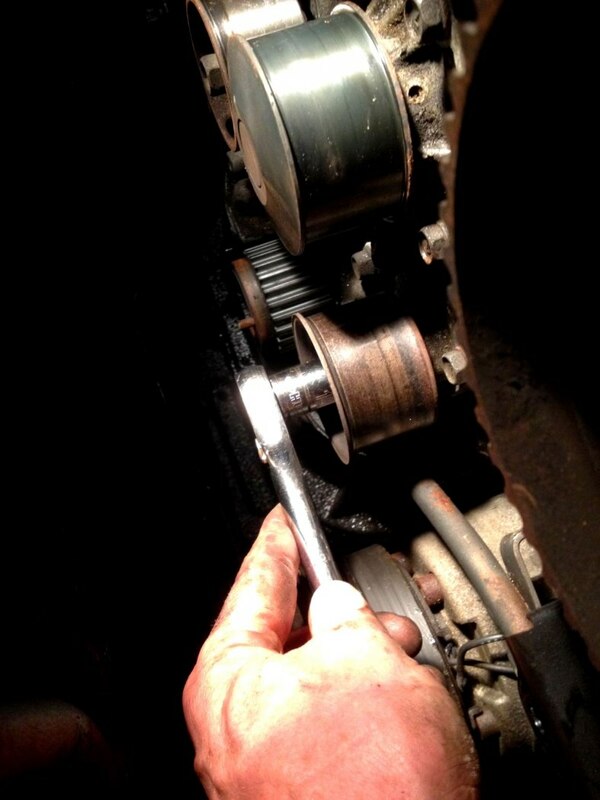 With the bolt out, you can just give the crank pulley a wiggle by hand and it should slide off the roll pin. 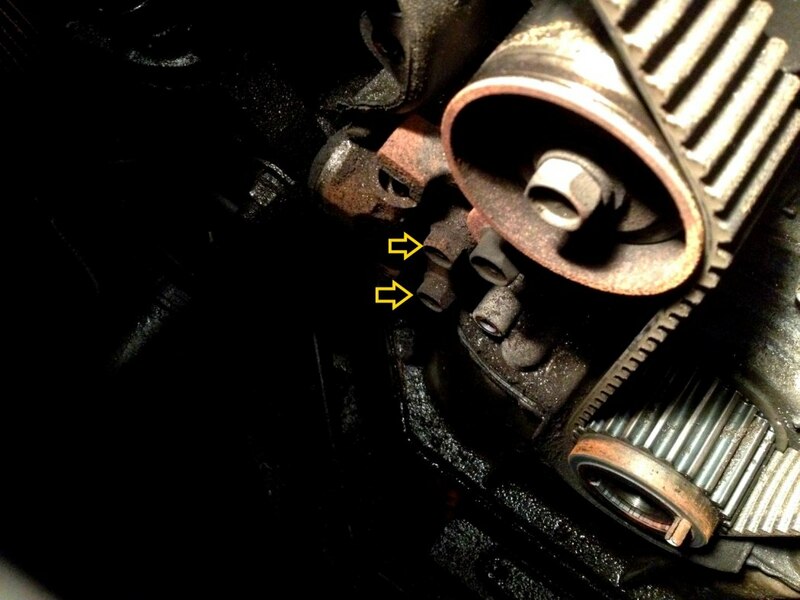 With the pulley off, remove the lower timing cover, there are 4 bolts. 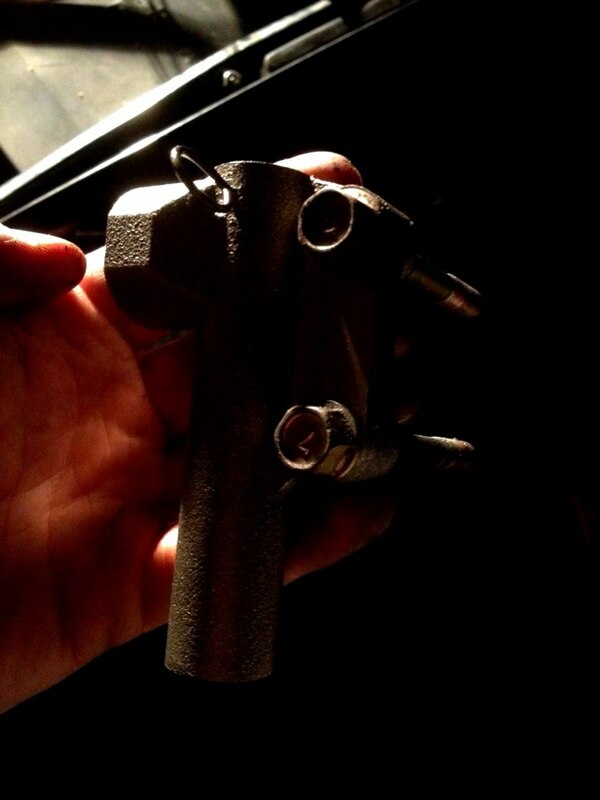 Now we can remove the engine support bracket. There are a couple tricky bolts on the support bracket, firstly, you want to make sure to remove the bolt holding the diptstick tube to the bracket. The next 3 bolts on the bracket are easy to spot, but the top one I've identified is quite far back and well hidden, it took me a while to spot this one and remove it. 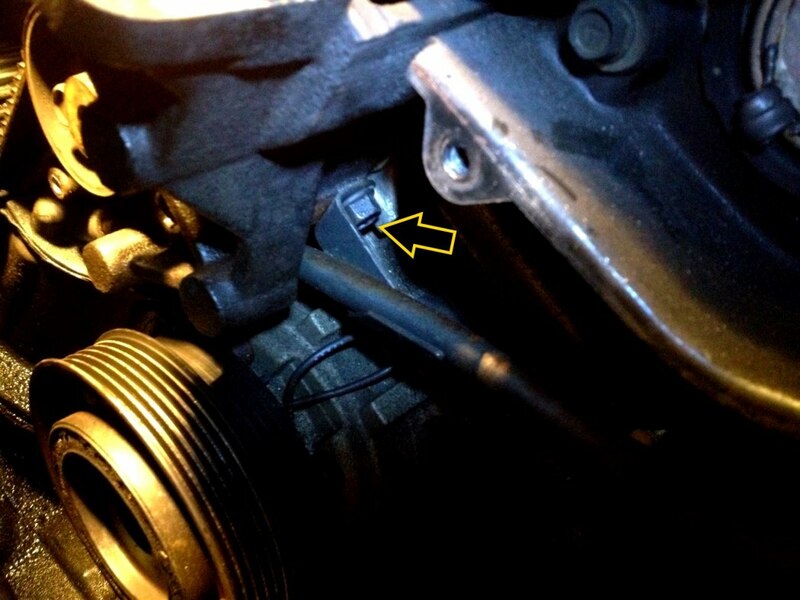 With the bracket out of the way you can progressively back out the 2 bolts holding the timing belt tensioner in, then wiggle the tensioner out from under the tensioner arm/pulley. 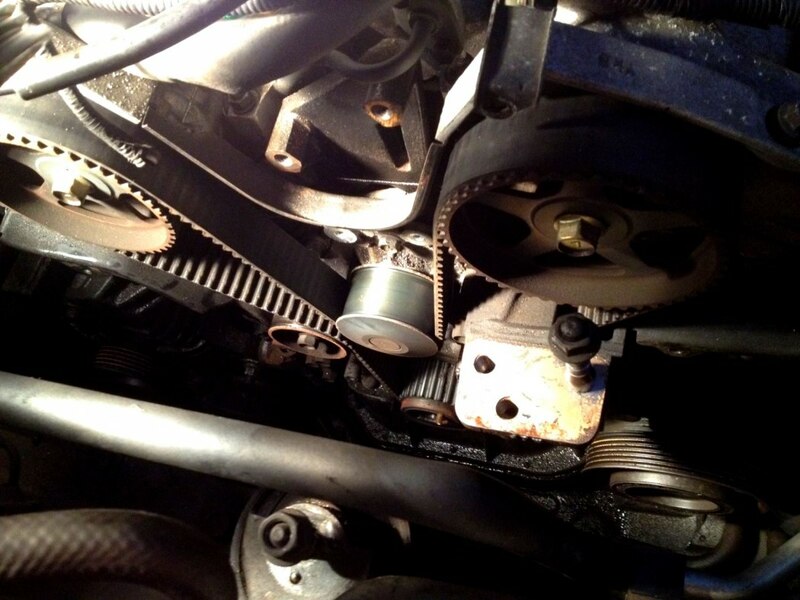 With the tensioner off you can flip the tensioner arm/pulley back and remove the belt. 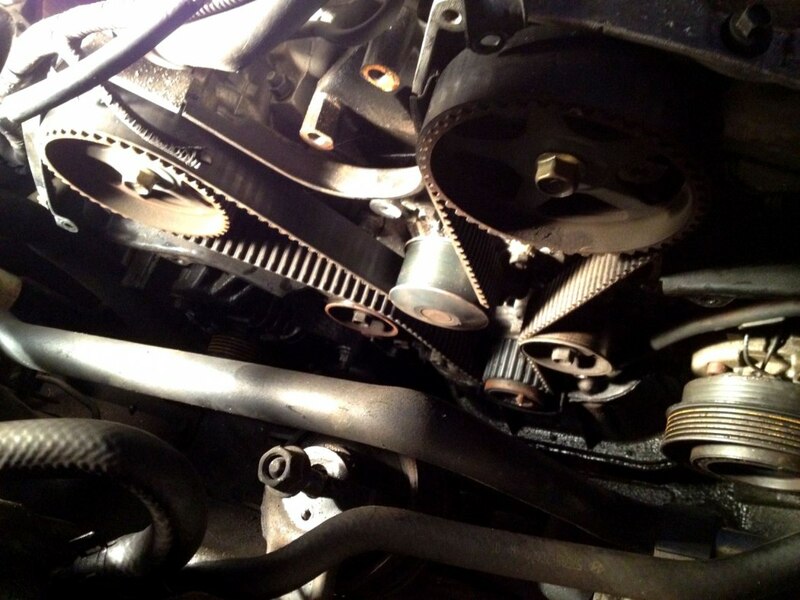 Remove the timing belt idler pulley and the tensioner arm/pulley. Now, I pulled the coolant out of the rad at this point, but in all honesty it made no difference to the amount of coolant that came out when I removed the water pump. 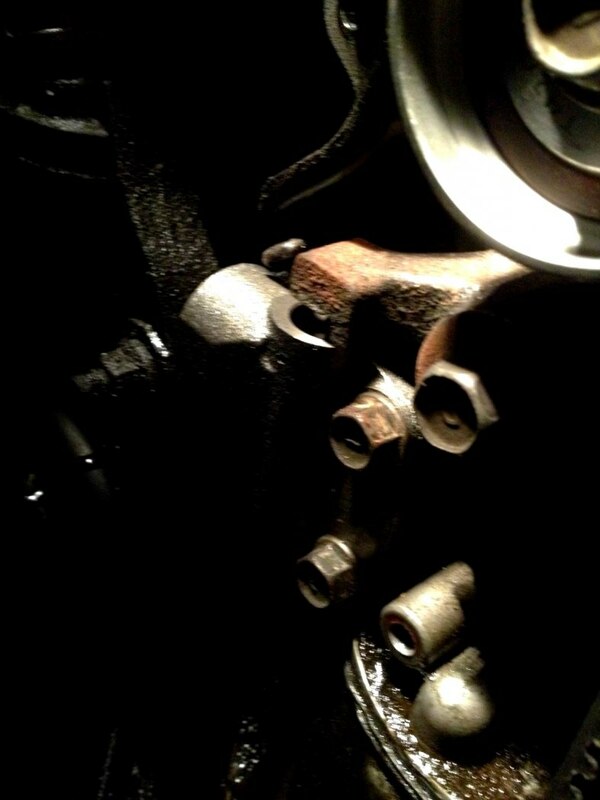 The rad hoses both mount high on the motor and with the engine cold and the thermostat closed, it's not like you can drain the block anyway. 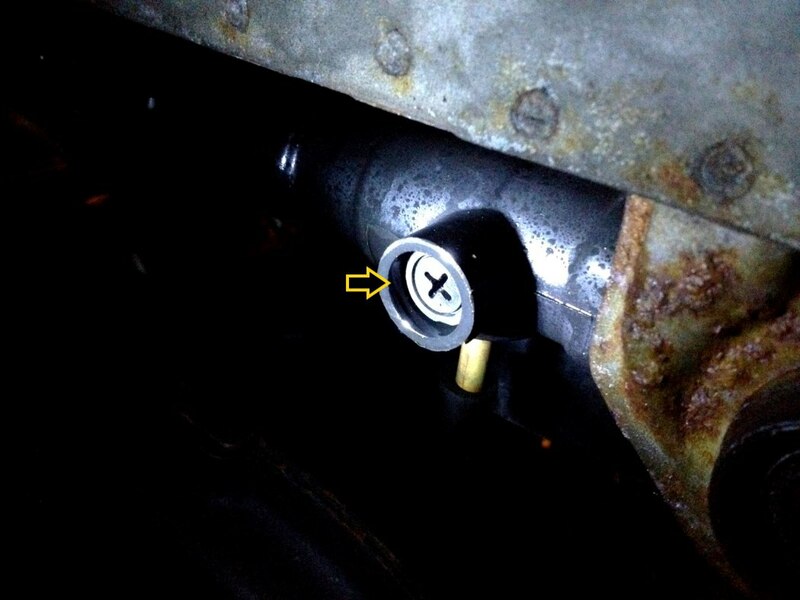 It is reported, apparently, that there is a block drain bolt somewhere on the back of the motor. 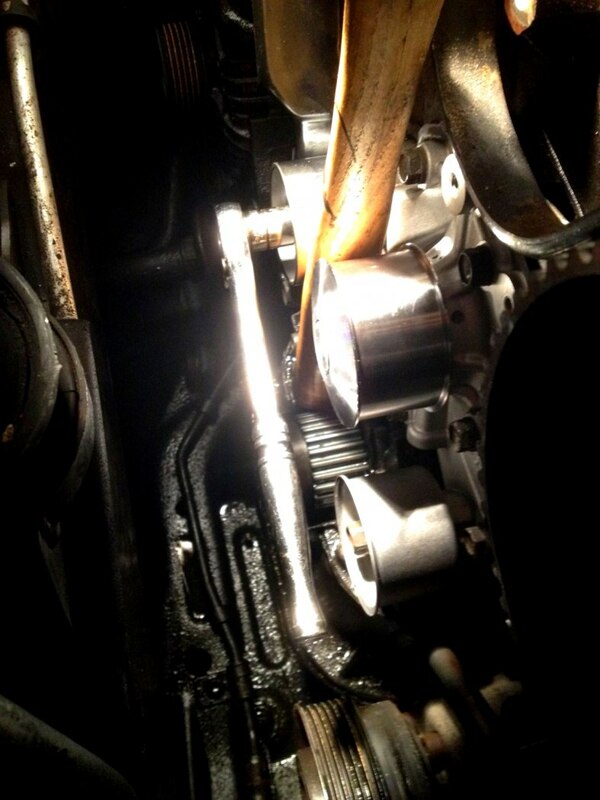 I wasn't about to get under the car with my questionable jack/support of the car to go looking for a drain, so I just positioned a tray under the motor and let the coolant come out from the pump itself. When removing the water pump bolts, there are some bolts that are longer and shorter, to avoid confusion I placed the bolts in the correct holes on the new pump as I removed them, then transferred them to the old pump, and pulled from there as I re-installed them on the new pump. Kept things organized. 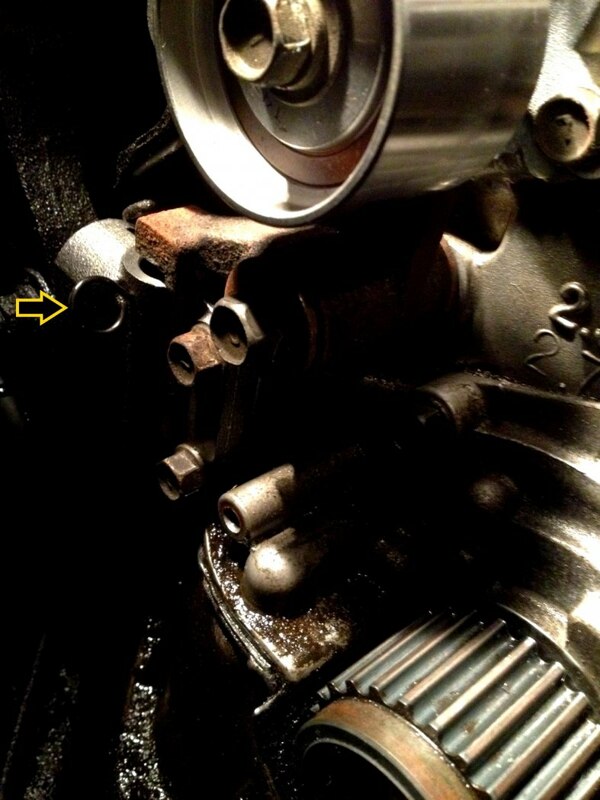 With the old pump off I removed the OEM pump gasket which was a very nice metal piece with a rubber coating. The Gates kit came with a fiber gasket. I was tempted to reuse the stock one but decided I might as well use the new fiber gasket so I put it on after lubing it up with dielectric grease. Most people would use some sort of sealant/glue or just install the gasket dry, but I've used DE grease on all my gaskets when assembling race motors because we disassemble them often, sometimes trackside in a rush and without replacement new gaskets, so having the gasket come off easily and cleanly and not having to scrape the gasket surface makes life a heck of a lot easier. I've never had any leaks that way, so I do this on everything now. 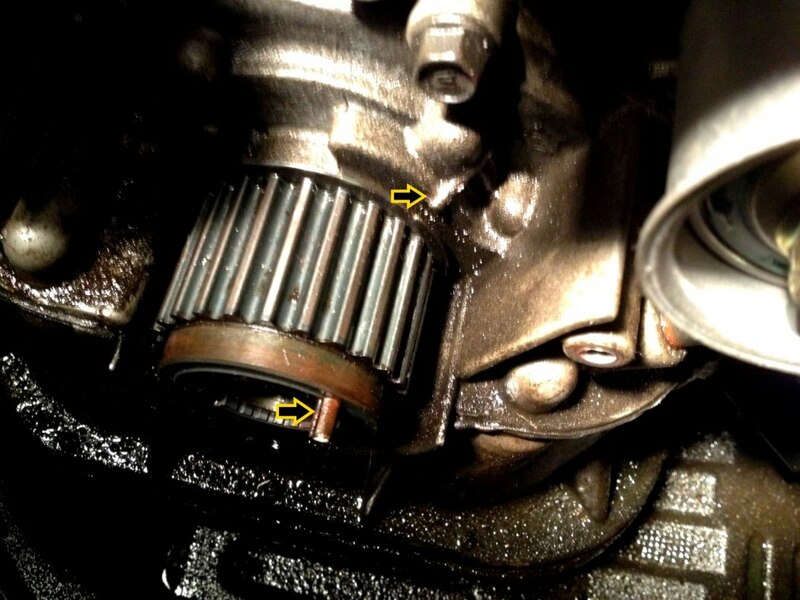 I've seen so many people just glob on tons of silicone sealant when installing gaskets and it squishes out everywhere, then you find globs of hard silicone in the oil, coolant, jammed in an oil passage in a cam, wedged into the gears behind a cover, just mental. 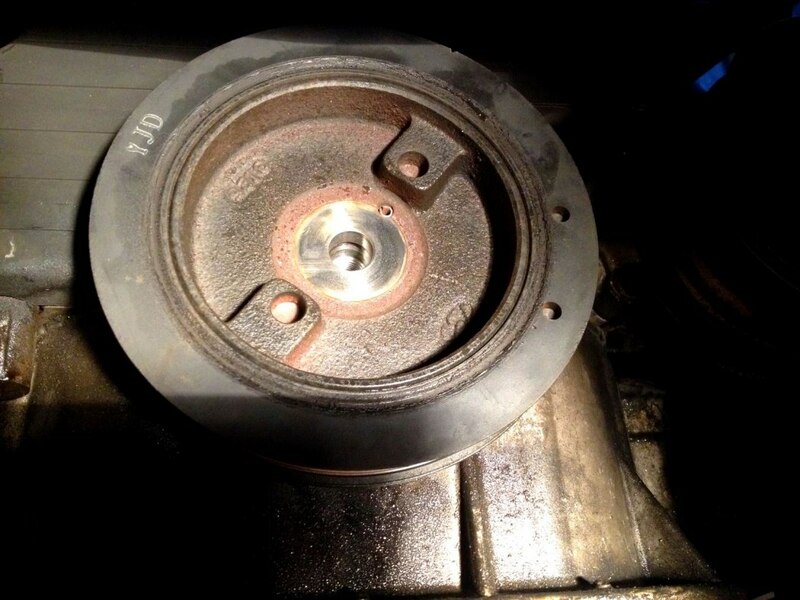 Don't use it unless your mating surface is right mangled or your gasket is subject to substantial pressure differentials across it (where using grease would allow the gasket to slip out sideways under a lot of pressure). And even then be very sparing. Anywhoodles. 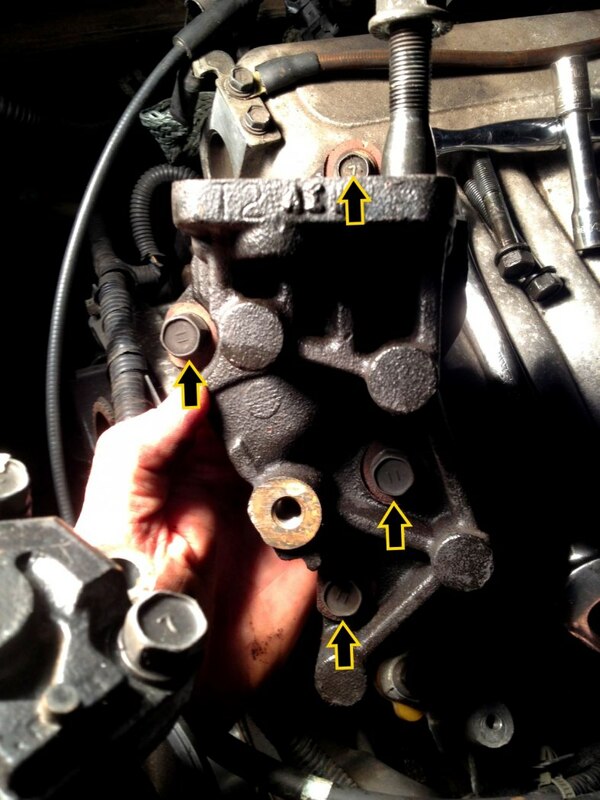 Install your new water pump. 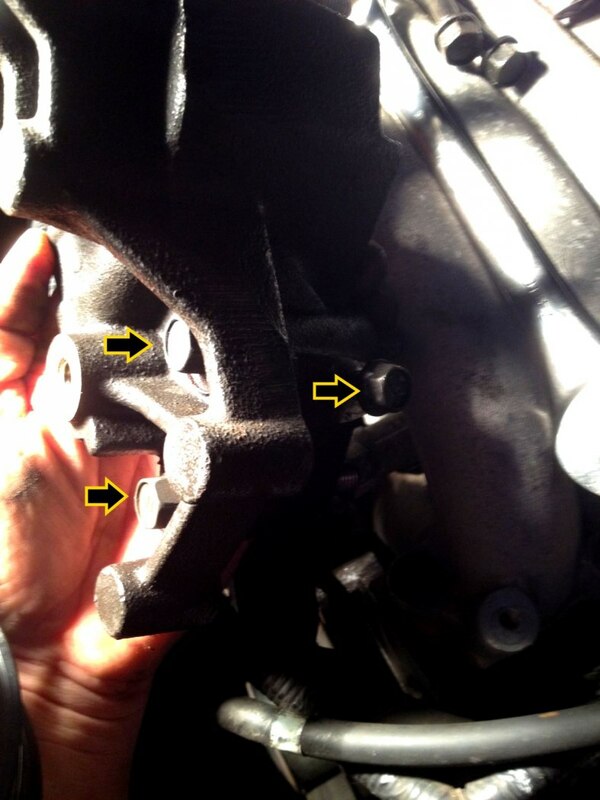 An important thing to notice, the top end of the pump sits behind the plastic cover which is under the cam sprockets. Make sure you slip that in behind before you place the pump onto the alignment sleeves, otherwise your pump won't sit flush and you'll break things trying to get the bolts tight. 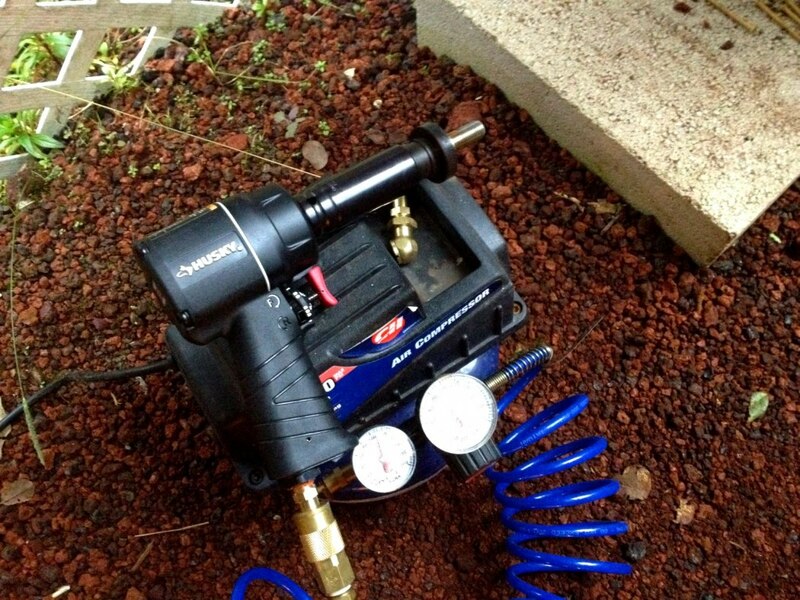 The pump will sit perfectly flush without any bolts in, if not you have a problem. 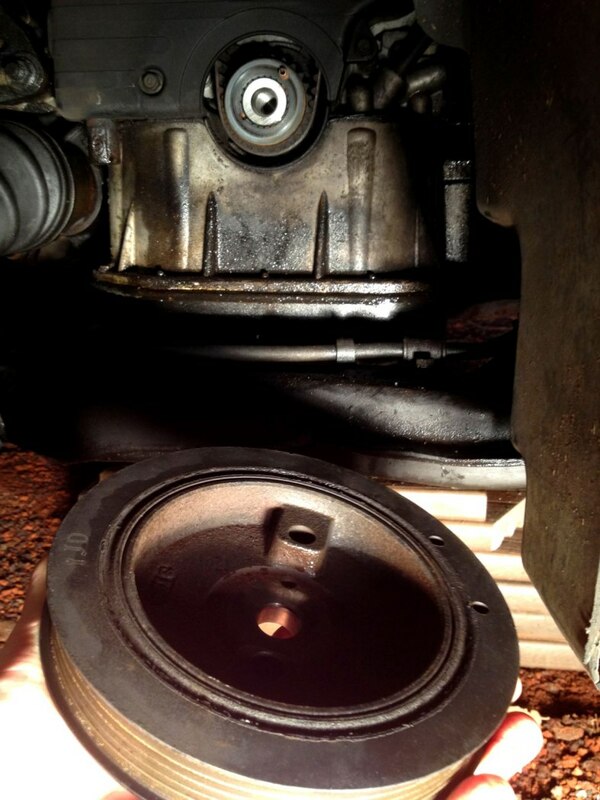 Install your new idler pulley making sure to line up to hole for the roll pin. It can only go one way on only this pulley can go here even though it looks similar to your new tensioner arm pulley. 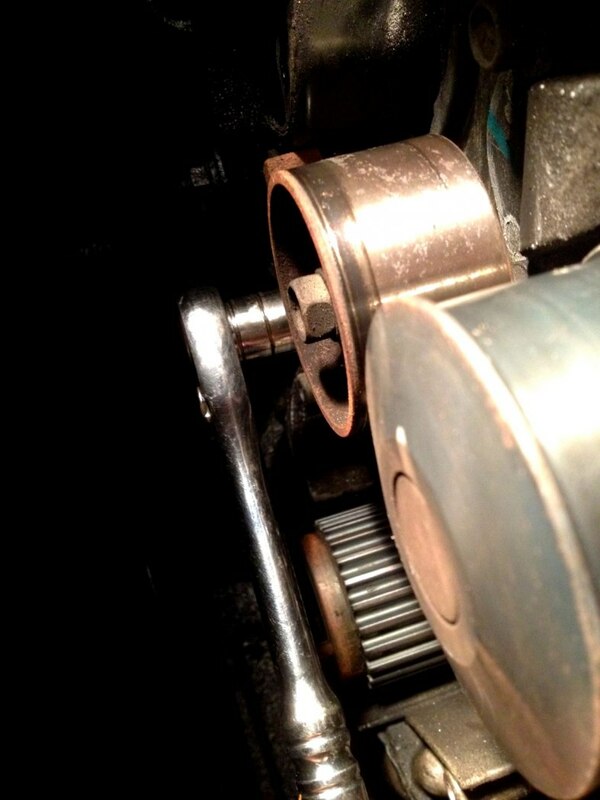 I reinstalled the tensioner arm to remove and install the new pulley. I had no real way to hold it (like off the car and in a vise), so I did it on the car and used a wooden hammer handle to hold the arm stationary while I tightened to bolt. 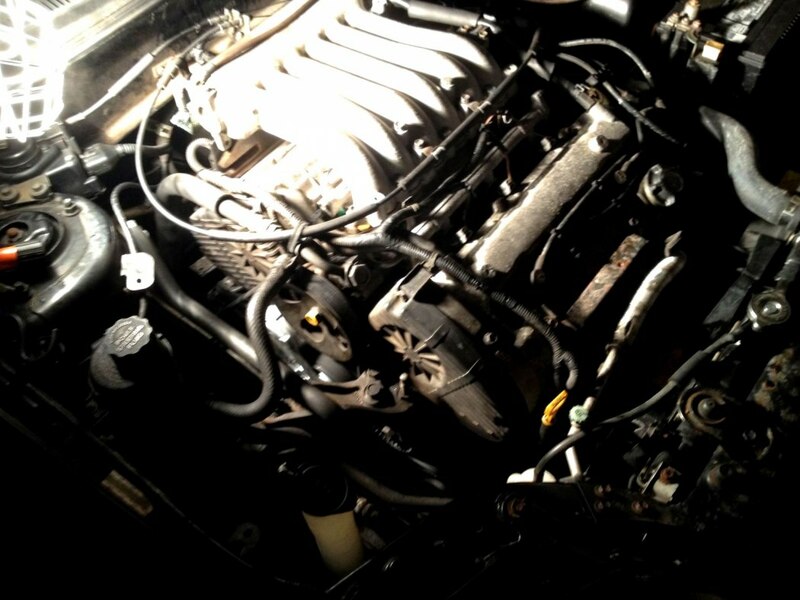 At this point I installed the new tensioner with the granade pin. 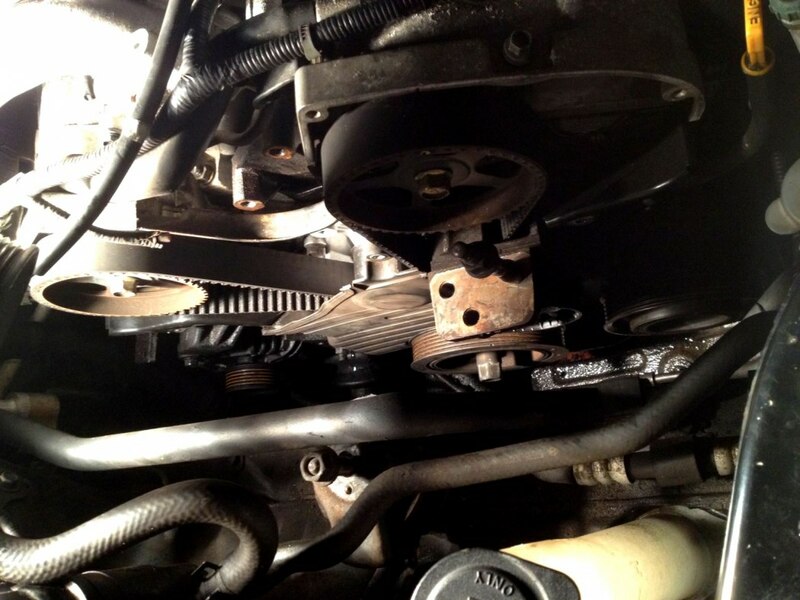 When I later went to put the new belt on, it was just barely too tight to slip over the tensioner pulley so I ended up removing the tensioner to get a tiny bit more play out of the tensioner arm. Once the belt was on it was easy to install the tensioner, so in hindsight I would only install this after you have put the belt on and gotten all your timing marks properly lined up. 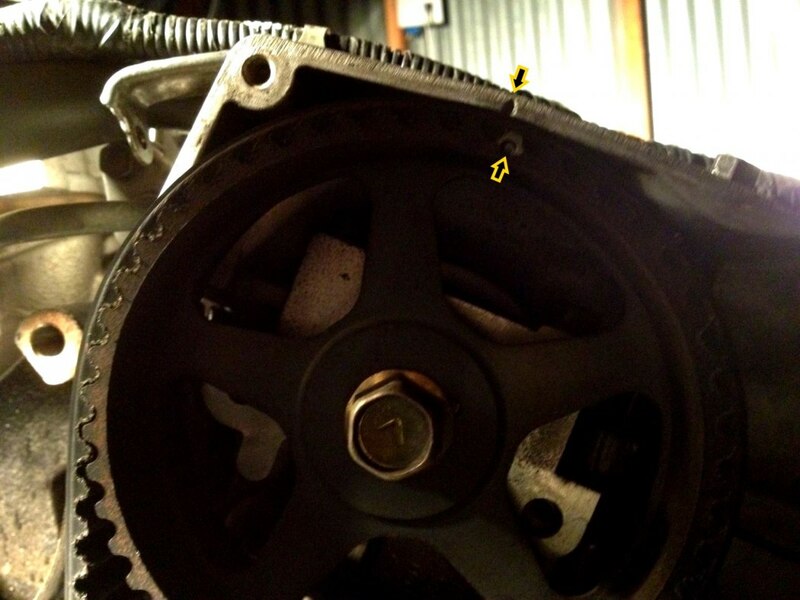 Now you can make sure your crank pulley is aligned with the timing marks using the roll pin and the boss on the block. When you are happy with the alignment slip the belt on. 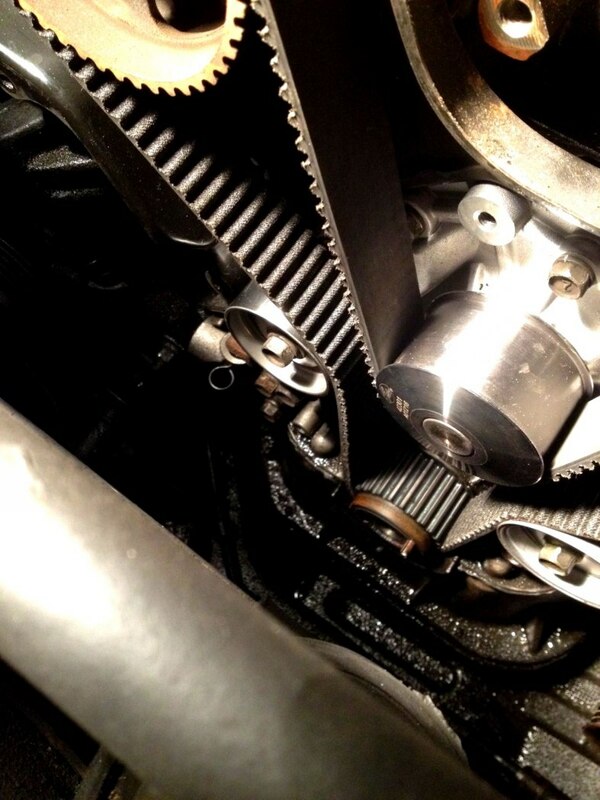 The next thing to do is slip the belt over the idler pulley and around the cam sprocket for the front bank. you'll want to make sure you keep a bit of tension on the belt when you slip it on. TRy and get your alignment marks close. 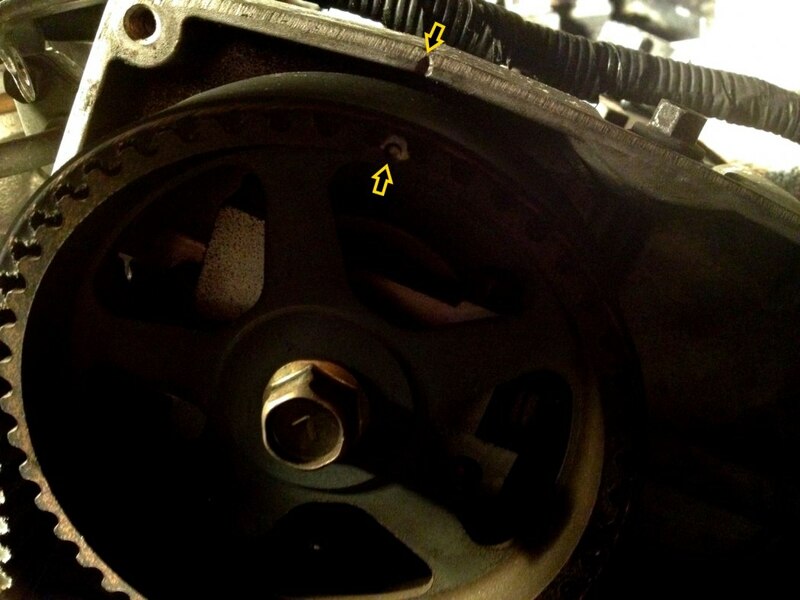 Then slip the belt over the water pump pulley and over the rear cam sprocket, then over the tensioner pulley. 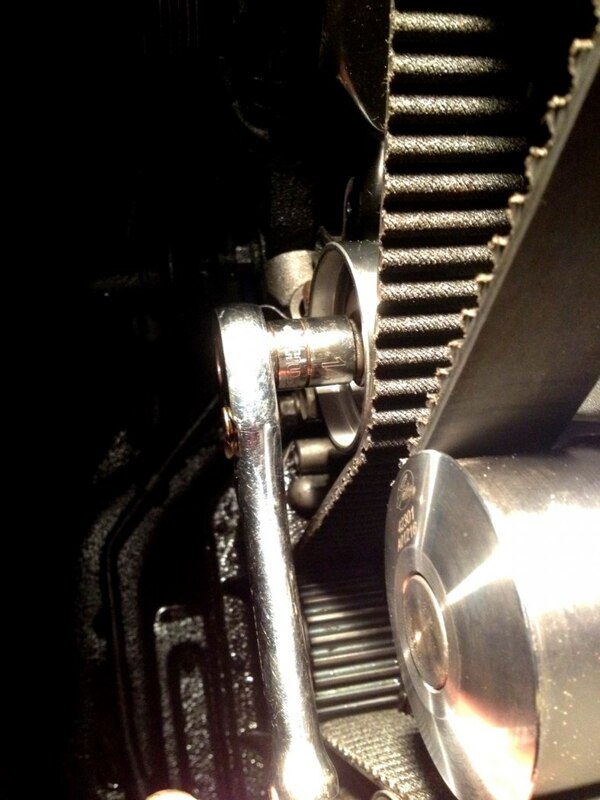 At this point I used a ratchet to just apply a bit of pressure on the belt using the tensioner pulley. 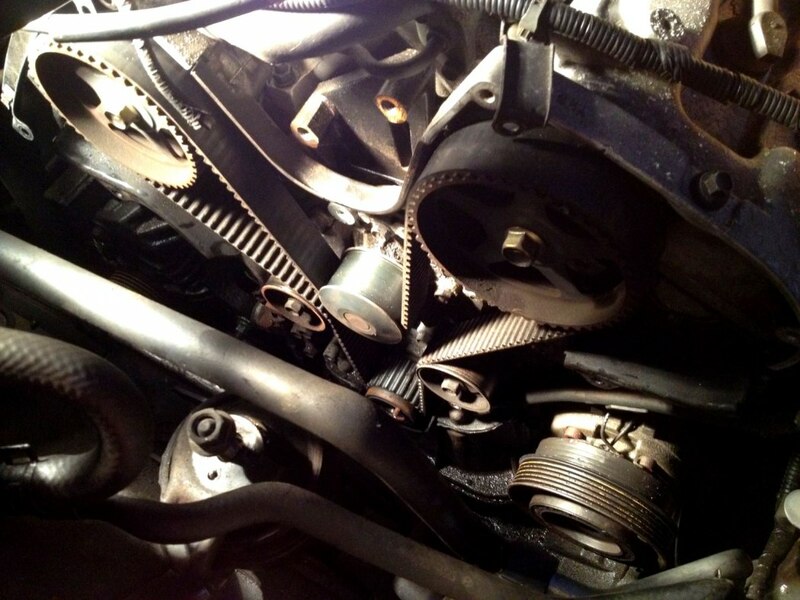 You'll notice that as the belt gets tight you'll probably pull the cams a bit past where you had lined them up. As you can see in the last pic, my rear cam ended up off by a tooth. 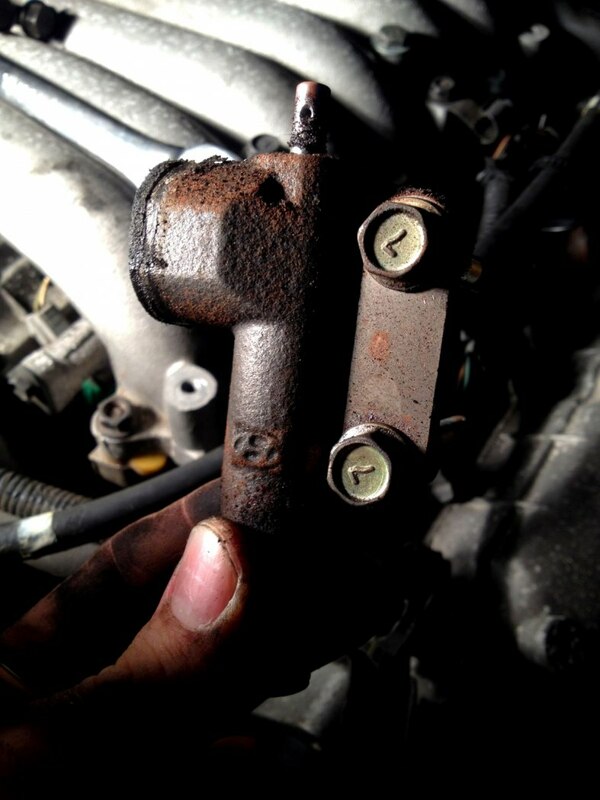 It can be a bit finnicky and you need to be very careful because it is easy enough to inadvertently pull the crank out of alignment, so make sure you keep checking your crank alignment marks and cam marks many times until you get everything lined up just right. 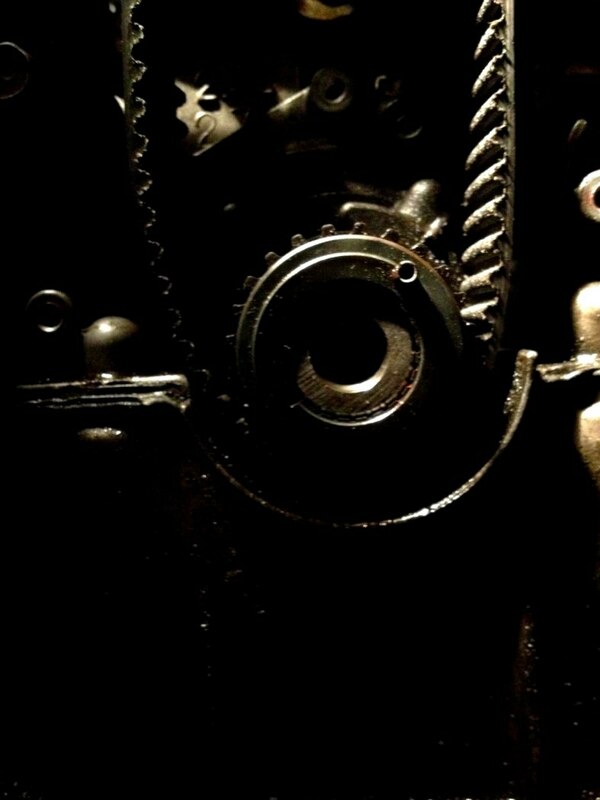 To make the process a bit less tedious, it can be handy to use a paint pen to put a mark on the belt where it is lined up with the crank pulley roll pin, and then mark the belt and cam sprockets to the proper marks. That way, if you end up with the cam off by a tooth (or more) like I did, you can paint the belt and the tooth that should have lined up. 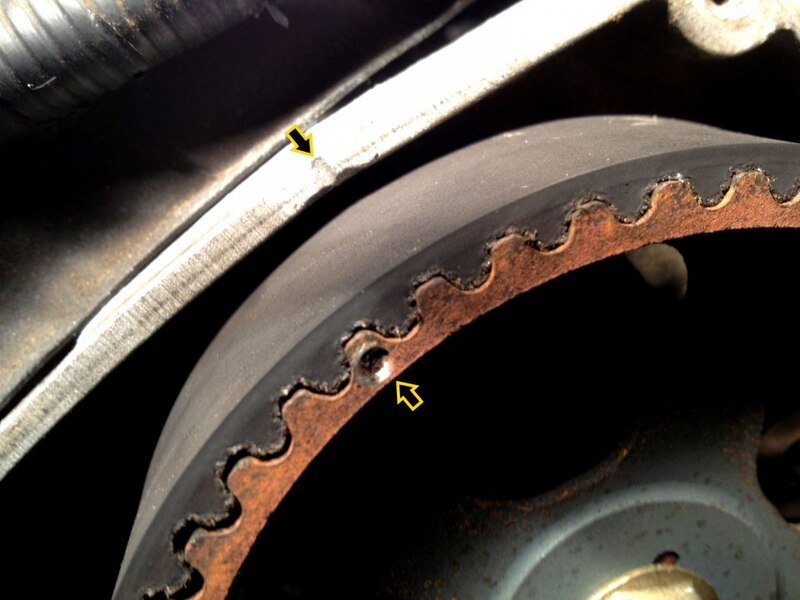 When you let the tension off the belt and slip it off the sprocket, it can be tough to see where the belt should have ended up (am I over a tooth from where it was now or did it move back on it's own? etc). Anyway you'll get the hang of it, just be thorough and check everything lots of times, you really really don't want to mess this up. It is important to note that with a brand new belt, you probably won'te be able to get the timing marks PERFECT at this point. 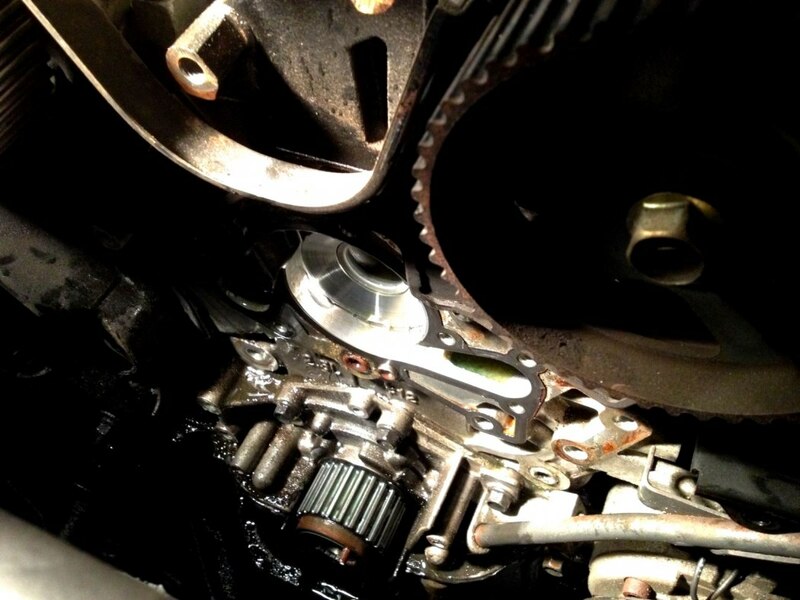 Basically, before you have the tensioner installed, and even once it is in and the belt is tight, the timing marks on the cam will probably be a tiny bit off from your timing marks on the head. 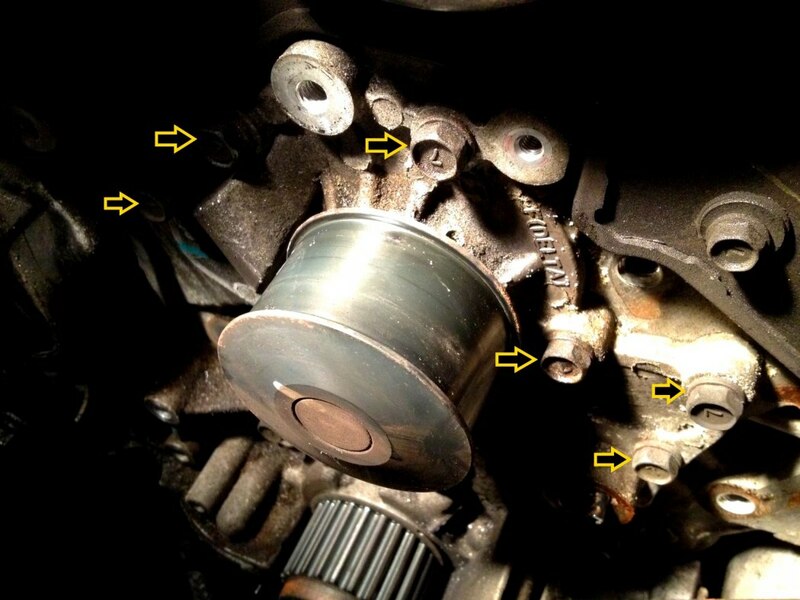 The reason for this is that as the new belt wears in and loosens up slightly, the tensioner will actually pull the cam sprockets counter clockwise from what you see here. So, as you can see by my pics, you'll end up with your marks a tiny bit clockwise of perfect at first. 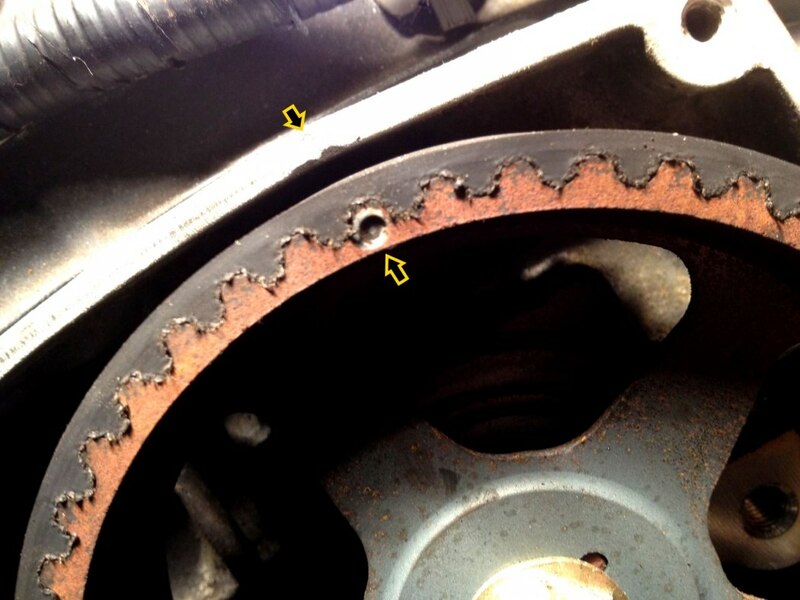 My front bank sprocket ended up about half a tooth out, and the rear bank sprocket about 1/4 tooth out from perfect. Anything less than a whole tooth is good. If you're a whole tooth out you need to move your belt. Something I found actually came in very handy here was using the camera on my phone to take pics of the alignment. Due to the challenges of having a line of sight directly at the front of the sprocket, I found putting the camera in where my head doesn't fit and getting an image with the lens perfectly square to the sprocket, it was a lot easier to spot any misalignment. Once you are happy with everything you can install the tensioner and pull the grenade pin to unleash it's tensiony goodness. 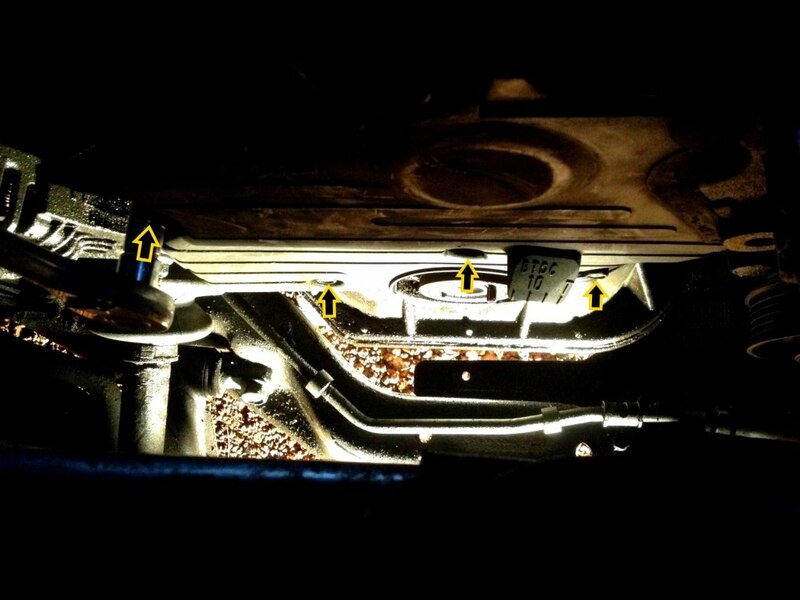 MAke one final check to be 100% sure that your marks are lined up, then re-install the lower timing cover, crank pulley, and engine support bracket. 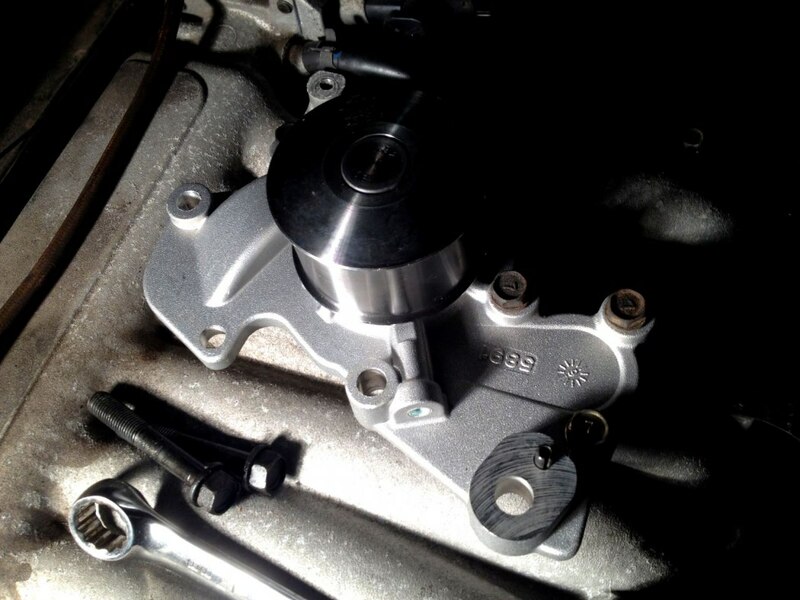 Now install your upper timing cover, power steering pump, serpentine tensioner and idler pulley, serpentine belt, and upper motor mount bracket. Next re-install your engine cover in the passenger wheel well. Remove the floor jack supporting the engine, or in my case, jack the car up and remove the support blocks. 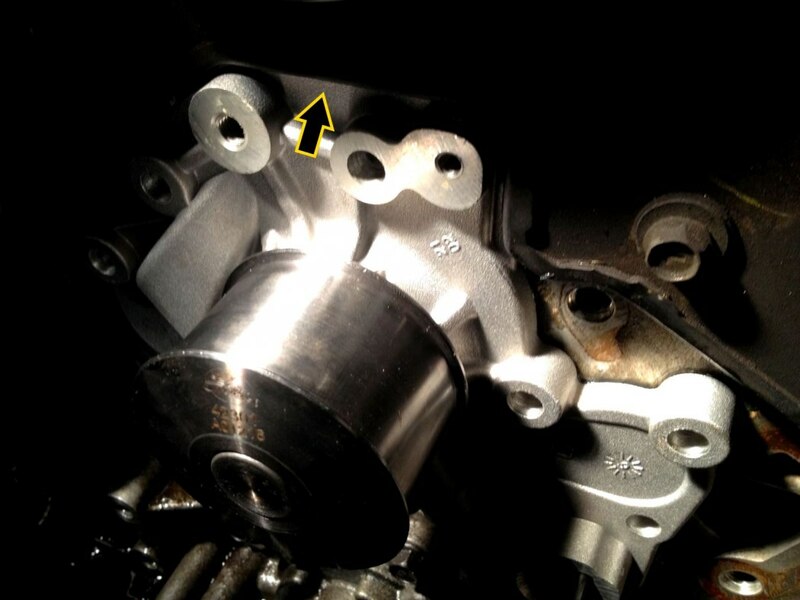 Make sure you've re-installed the sensor wire to your PS pump, and zipties you removed/relocated, make sure your throttle cable sits in it's holders properly. And you're pretty much done. 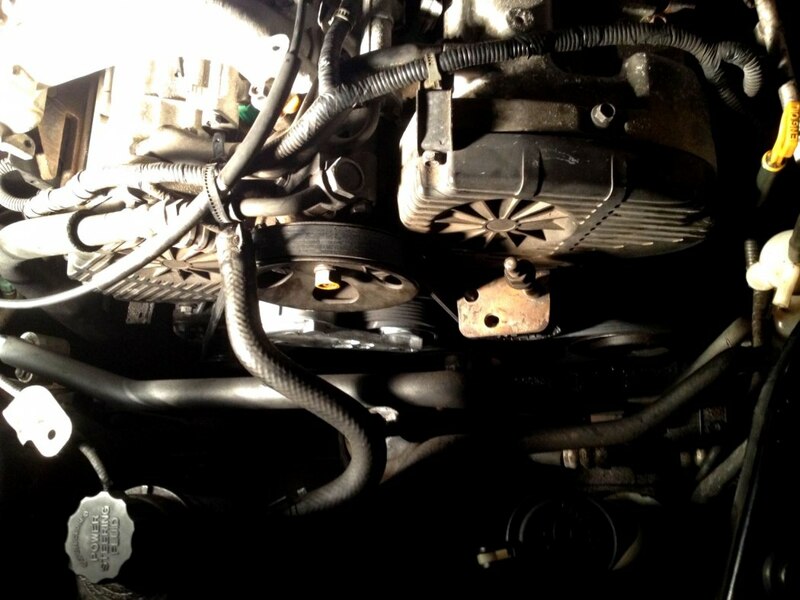 To refill the coolant in the block, I actually removed the housing that the upper rad hose is connected to on the block and filled the block and radiator with water. I then went through and filled/burped everything until I was happy that everything was topped up. I've been driving the car around a bit with just water in it because there is no risk of freezing here, and I wanted to do a proper flush of the system before I refill it with coolant, as I did notice a lot of junk floating around in the coolant no doubt from the failed water pump and just age.